Blue-Eyes Shining Dragon - Yu-Gi-Oh! This card cannot be Normal Summoned or Set. 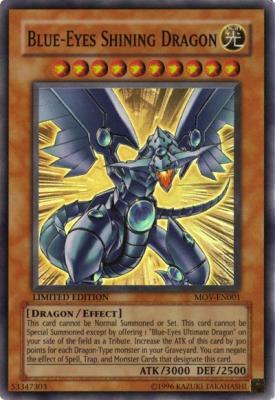 This cannot be Special Summoned except by offering 1 "Blue-Eyes Ultimate Dragon" on your side of the field as a Tribute. Increase the ATK of this card by 300 points for each Dragon-Type monster in your Graveyard. You can negate the effect of Spell, Trap, and Monster Cards that designate this card. Je joue a yu gi ho donne mooi exodius contre fleur prenne sinon cas s ta tuée ! !